Tag Archives for " marketing calendar "
Let’s face it, if you own a small business, there’s probably more to do than time in the day, week or month, right? The key is to get good at doing the high payoff items and planning for what needs to be done when. Prioritizing is how you make decision making easy and help everyone stay focused on the tasks that produce wins. One of the foundational elements of the Duct Tape Marketing System is the idea of living by the marketing calendar. If you take the time to identify what it is you think you want to do with your marketing and then commit it to an annual calendar, it’s more likely that you will actually get to it on a consistent basis. There’s something very powerful about the visual reminder that you’ve committed to producing a press release every month for example. 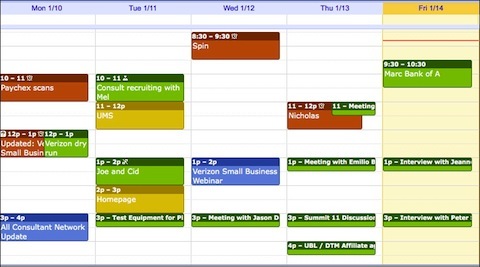 While many people are familiar with the idea of a marketing calendar, few actually live by it. Over the years I’ve also trained business owners to use the marketing calendar in another very powerful way. Quite often there are projects that are identified during the planning process that simply can’t be accomplished with the resources available today. One of the most powerful things you can add to your calendar routine is monthly themes around foundational marketing projects so you break them up and spread them out over the course of a year. So, February becomes “start a blog month” and March is “start an enewsletter” and so on. This way you don’t get overwhelmed and at the end of six months you look up and you’ve accomplished a great deal. Step 1 – Create a monthly calendar in Excel or Google Docs. Break the columns into weeks so you can plan in that space. Down the left side add categories for all of the major chunks of your marketing. At the very least this would include Advertising, Public Relations, Referrals, Social Media, SEO, Content, Events and Your Monthly Theme. Step 2 – Choose a monthly theme and put that across the top near the name of the month. Step 3 – Fill in all of the planned activities that you can by either describing them or putting an X in for routine activity like a weekly blog post or Facebook update. Once you lay it all out on the calendar you’ve also got to break it down into weekly and daily action steps and assign tasks accordingly. Sometimes that means assigning yourself a bunch of tasks. You can do this by creating different daily calendars in Outlook or Google Calendar and creating color coding that allows you to focus on assigning tasks for different topics and then having a visual display of your day’s focus on multiple areas of marketing.